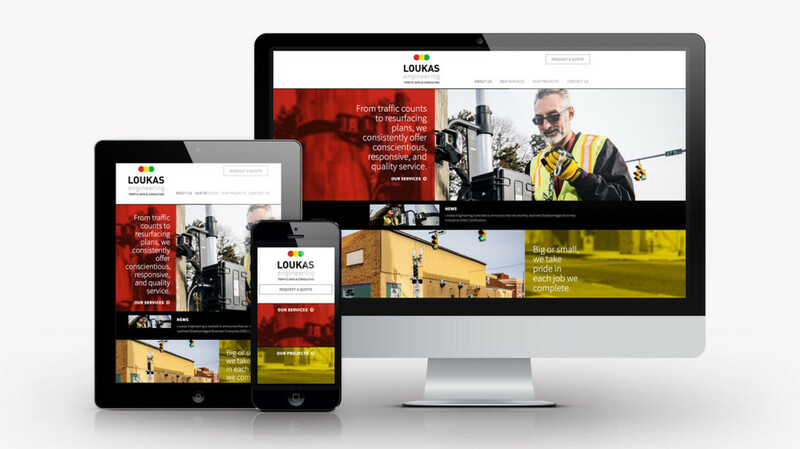 When we designed Nick & Shelly Loukas’ website about a year ago, we visually portrayed both their honest, down-to-earth personalities and their eagerness and energy for the traffic consulting work they do. Compelling photography shows them at their work; bold red/yellow/green overlays and grounded copy combine to affirm Nick & Shelly as trusted traffic study experts in Northeast Ohio and beyond. When it came time to create a trade show handout, we sought a unique solution that would wow the crowd and stand out in a pile of myriad brochures, leaflets, and handouts that attendees would undoubtedly collect. A standard tri-fold wasn’t going to cut it. Initially, we investigated special printing techniques, unusual die cuts, and other techniques, but the issue of production cost, as on any project, was a concern. 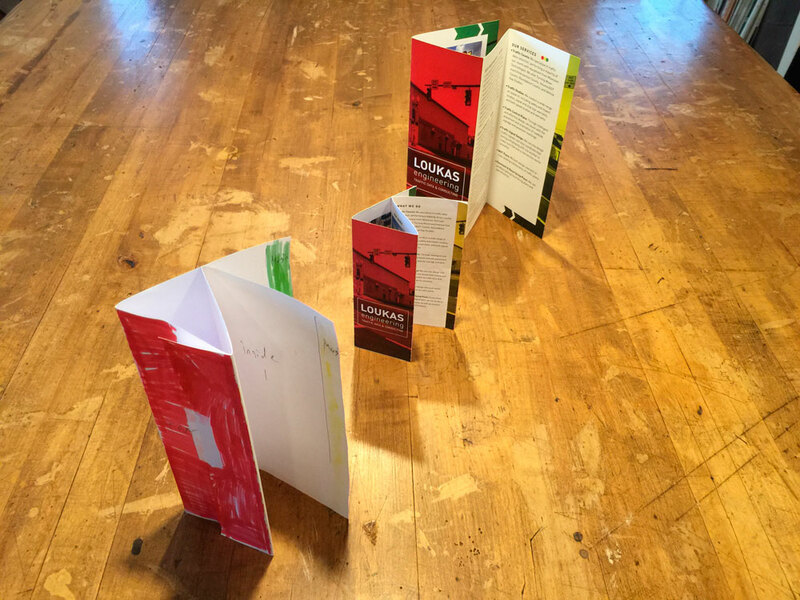 We then looked for innovative and eye-catching folding solutions that wouldn’t add much (if any) additional cost over a traditional tri-fold brochure, while still having the level of excitement and novelty the project demanded. We prototyped numerous ideas with regular copy paper, but nothing struck us as THE solution. In the end we researched and adapted an interesting pattern from Trish Witkowski’s phenomenal book “Paper Folding Templates for Print Design: Formats, Techniques and Design Considerations for Innovative Paper Folding.” If you’re looking for cost-effective, unique print solutions, we can’t recommend this resource enough. 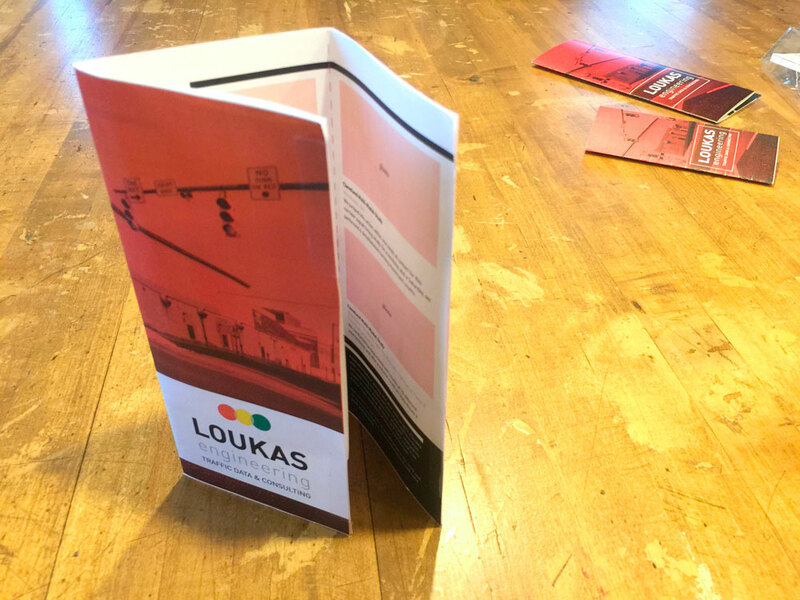 This unique folding technique provided us with a few exciting opportunities in and solutions to the design process, namely showcasing the bold, three-color motif from the Loukas Engineering logo along the exposed page edges. These extended “tabs” also allowed the photography to wrap around the entire exterior of the brochure, with the right-most edge reducing to an abstract, graphic element when the pages were opened. 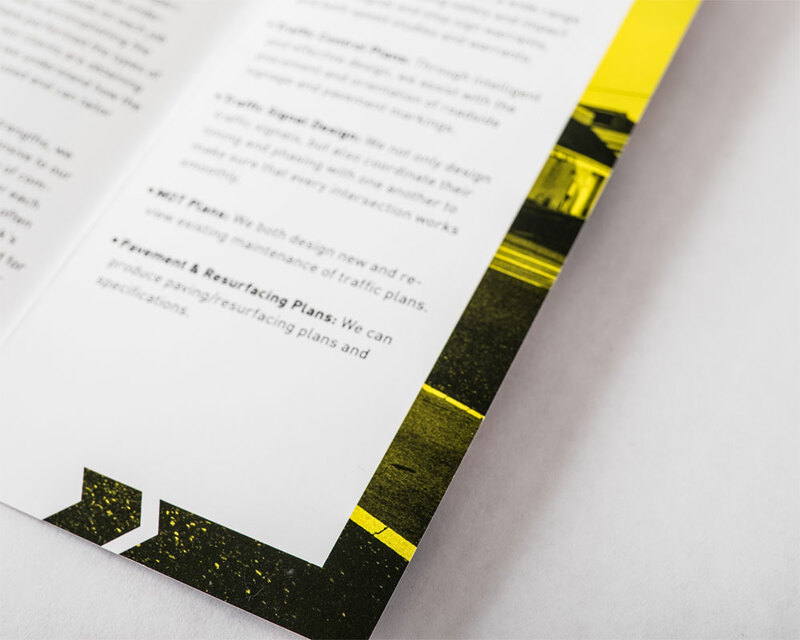 The unique folding pattern allowed us to easily organize the different sections of the brochure, providing a clear flow and structure to the entire piece. 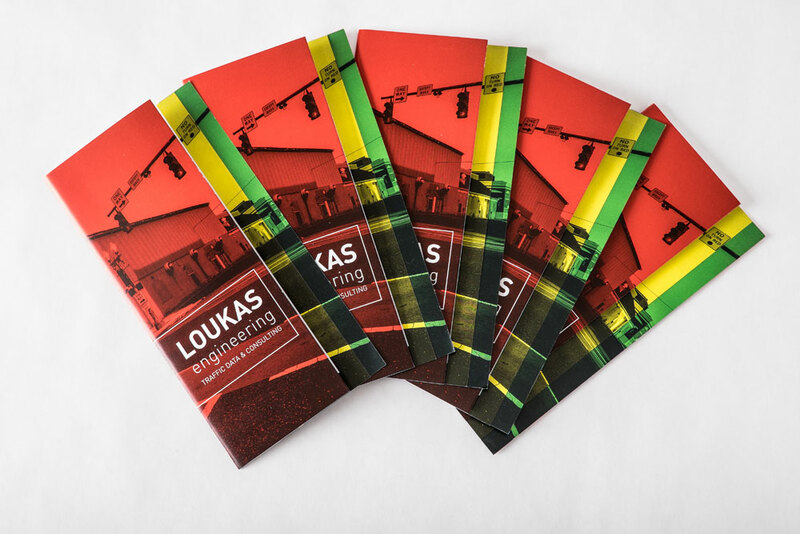 Also, being ½” wider than a standard tri-fold brochure, the Loukas Engineering brochure won’t be easily lost in a pile. 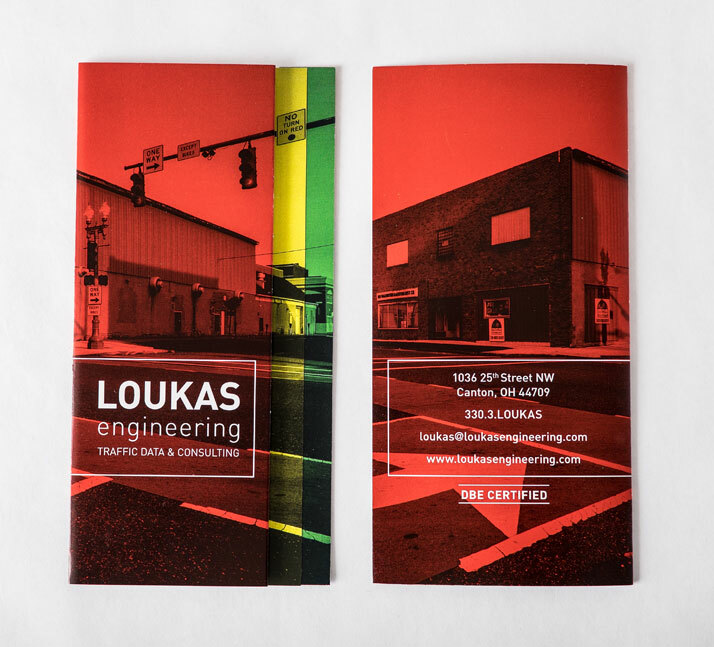 In the end, the bold visuals of the website translated easily to this print piece, reinforcing the Loukas brand and creating a cohesive presentation among all of Nick’s and Shelly’s materials. « 2016 Colors Are Here!